It was a Tuesday afternoon, the kind of perfect, rare Michigan weather that makes you happy to be alive and experiencing the world. An avid horsewoman, I could think of no better way to spend the day then with my family and my horses. I set out with three family members on a ride through the trails adjacent to our barn. I remember looking down at my reins, getting the feel of how much pressure I should use to stop the horse. Instantly, I was rushed into the present moment as the world exploded in gold, and an intense fire erupted out from my right leg. Had I been attacked by bees? No, bees didn’t feel like this. Nothing in my life had felt like this. I screamed out, “Your horse broke my leg!” as I somehow realized what had happened. The pain was unrelenting, unlike anything I had ever experienced. The intensity did not fade. It felt as if the point of impact stretched out indefinitely. I was broken, torn to pieces. It was the closest thing I could imagine to being in Hell. My accident was a physical ordeal that left me with an appreciation for how much I took my body and my ablism for granted, but I can’t say that I was traumatized in any way. As I began to read more about accidents and the nature of trauma, I found that my experience was not the norm. More then 52% of orthopedic patients with broken bones suffer from PTSD and worsen over time (Starr, 2004). I was left to wonder why I was one of the lucky ones that didn’t. Human beings are instinctual animals. When a human perceives danger, we respond in one of three ways, by fighting, fleeing, or freezing. Because we are, in a sense, pack animals, we are biologically attuned to detect body responses in others that signify danger. When we observe another person narrow their eyes, tense their muscles, and prepare to fight or flee, we are able to feel what they are feeling and react in a split second. If a horse senses danger, he will run, and the herd will follow him without investigation or question. The horse that is slow to react is the one that is left behind, possibly to perish. Evolutionarily speaking, those of us humans that are still here are, like horses, descendents of ancestors that had the fastest and most accurate ability to detect fear and respond to it (Levine, pp. 39-45). During my accident, I was able to discharge the energy reaction of my fight-or-flight response. Initially, I felt trapped on the horse, knowing that if I broke down and allowed myself to process that energy, it would negatively affect the horse and put us both in danger. I had to keep the energy contained until I was on solid ground, and not in control of the horse/human partnership. 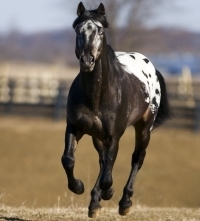 When a horse detects that the human is not engaged and present, they will take over and make decisions about what is a threat, and usually react to most things by running away, very quickly. When I was lowered to the ground, I was given some space to process the energy in my body. I began to rock back and forth, clutching my leg, screaming out with a power that I had never felt so intensely before. It was more than a yell of pain or anguish; it was a force moving out of my body. I shook uncontrollably. Somewhere in my mind, a quiet voice observed that this was a good thing, that I was processing the trauma. Had I fought the intensity, been told to calm down, been strapped down or medicated, the energy would have remained in my body, and I would have been stuck in that state of physical hyperawareness (Levine, pp. 54-59). I have found a new appreciation for the capacity of the body to grow, change, and heal. As I write this, my broken bone is healing, and in the end will grow together to be even stronger and more resilient then it was before. It may be scary to realize that many of the primal, instinctual responses our bodies have are working without the input of our frontal lobes, but it’s also amazing to realize the innate power that we have within ourselves. We have evolved to be survivors, not victims. We are automatically attuned towards growth. Starr, A. (2004) Symptoms of Posttraumatic Stress Disorder After Orthopedic Trauma. The Journal of Bone & Joint Surgery, 86, 1115-1121. Today’s guest contributor, Katie Darling, is a doctoral student at the Michigan School of Professional Psychology.